I can’t believe it’s been nearly 25 years since I voted in my first Presidential election, which featured the very first and only true opportunity by a third-party candidate to potentially win, at least in my lifetime. I knew Perot because my father, at the time, worked for EDS, which Perot had founded and had run for many years. So, the name was very familiar in my house. When he went on TV one Sunday night and pulled out all of his charts and sat down and explained why America could not continue down the path it was on, and why his was a better path, people were intrigued. In fact, it went a bit further than that for awhile, as he actually led in the polls for a short time against the major candidates, President George Bush and Arkansas Governor Bill Clinton. Eventually, the campaign fizzled out after what can only be described as a bizarre sequence of events where dropped out only to re-enter the race, only to find out that he could not recapture the spotlight. Once he re-entered his vice-presidential candidate had one of the worst debate performances I’ve ever seen, which, at least in my opinion, sealed the deal. While he got almost 20% of the popular vote, which is nothing to sneeze at, he didn’t win a single state. Looking back, it was kind of a watershed moment. Not in decades had a serious third party candidate mounted an actual campaign. Even though he didn’t have a chance going in, after the election, many wondered if his campaign could serve as a springboard for his Reform Party or other parties to establish themselves as credible challengers moving forward. As we all know, the answer to that has been a resounding no. The two major parties have put a stranglehold on Washington and on voters. Perot’s run was considered ‘one for the ages’, but unfortunately the legacy includes the ‘one’ as a big part, as his run didn’t pave the way for any positive changes. The thing about that election and the intrigue that Perot brought, is that people weren’t looking for the changes that he was bringing forward. They were perfectly fine picking between the established sitting President and the rising star Governor. However, Perot captured the spotlight and made people question that perhaps they were ready for a change. Unfortunately, asking the question was about as far as it got. A quarter century, people asked the question, thought about it for a good long time (which is when he stuck around near the top of the polls), but then were perfectly fine to answer ‘No, no changes needed’ when push came to shove. Heck, if you want me to be truthful, I think that Perot himself may not have actually been ready, which could very well explain his abrupt withdrawal. The idea of upheaval and being responsible for it might have just been too much for him to handle. Fast forward 25 years and look at where we are now. People are ready for that change. So much so, that if Ross Perot had a time machine and ran today as he did back in 1992, I think he would, hands down, win the election. Unfortunately, Perot is now 85, which is why I said he needed a time machine. Bernie Sanders. Hillary’s main competition, that stood pretty strong for a pretty long time, ran on a socialist agenda. He campaigned on the fact of making government bigger, of raising taxes, and redistributing wealth. All of these things traditionally get any candidate slaughtered, yet people craved change so much that they stuck with him, sometimes passionately so. Ted Cruz. This crackpot is so far to the right that colleagues seriously describe him as carrying a Constitution around and consulting with it on every decision. An extremist like this would normally not made it out of Iowa or New Hampshire before having been run over by the more ‘traditional’ brand of mainstream candidates, you know like Jeb Bush, John Kasich, or Scott Walker, yet none of those guys caught so much of a sniff of a chance. Yet the guy that openly preached right wing extremism took it the furthest. Donald Trump. And of course, you have The Donald. It’s looking like he will be nominated by the Republican party for President in a few short weeks. This will probably happen even though not one single Republican politician seems happy about it. Yet, here he is. The bottom line is that people are sick and tired of the same old stuff because they know it’s going to lead to the same old garbage. People are getting more connected. The Internet and explosion of smart phones and tablets has done this. It lets people know, more so than ever, what’s going on. People now can see that the traditional candidates really don’t care all that much. Well, they care up until they get your vote, but after that, you mean nothing. Heck, sometimes they don’t even care that much. I remember in 2008 when John McCain was the Republican nominee, he gave up on Michigan around August. This behavior is fairly common, yet they promise that they’ll look out for us. People want change. They crave it. A I said above, I think that Hillary will win. Even though she’s fully entrenched in the establishment, she is less ‘out there’ than the rest. However, Ross Perot’s campaign that he ran in 1992. That would have been perfect. It would have resonated very well. I think he would have mopped the floor with any of the other candidates this year. His margin would be huge if he ran today. That was a thumping of epic proportions. People are ready for change. It might not happen this election, but I’m pretty sure it’s going to happen soon. We just need someone that makes a little sense. Readers, what do you think? Do you agree that Perot’s message would have hit home today? Or do you think it would have turned out the same way? For those that remember, what are your memories of Perot and his impact on the 1992 election? I voted for Perot in 92. Putting politics and emotions aside, there is a desperation building in the U.S. and world. People are getting desperate. Facts show there is more poverty today (on a per capita basis) than ever before. Sovereign debts around the globe are larger than ever. The rich are getting richer and the poor are getting poorer. This is totally unacceptable and unsustainable. The system run by elites is not working. There needs to be change. But how? I don’t know. I don’t claim to know. I don’t know, I think things have to get a whole lot worse before anything happens. Could be decades, but something will have to force change. Of the candidates, I still hope Clinton could make it as she’s the one who can make sense more of these problems America has been facing and enduring and address these as soon as possible. We want change we long to see. I see Clinton as more of the same. I see Trump as trying for change but not addressing what needs to be changed. The election is shaping up to be very disappointing. Interesting thoughts on Ross Perot and the time machine. Sometimes “luck” really does have to do with timing – but if, as you say, HE wasn’t ready (just as the U.S. wasn’t ready for him) back in ’92, it follows that the 60 year old Perot wouldn’t be ready now either, right? I’m keeping all bets off. I’ve been shocked by Trump’s rise, and I was shocked by Brexit. The polls change on a dime. The U.S. is in for a very interesting time – and we in the rest of the world are definitely watching. Where I think it’s different is that, at the time, the country really wasn’t really seeking the dramatic change that he was offering. He likely feared or maybe knew that if he went in and shook things up, the population might not have truly gone along with it. I think that today, as shown by the popularity of Sanders and Trump (both very non-traditional candidates), the country is ready for change, and I think his chances of having the country behind him would have been far greater. Perot may have hit home today, but I still feel that as much as Americans ‘think’ they want change, it’s really hard to change. I was a voter in ’92, but I honestly didn’t follow politics. I’m sure I voted, but can’t remember for who (not Perot, though). 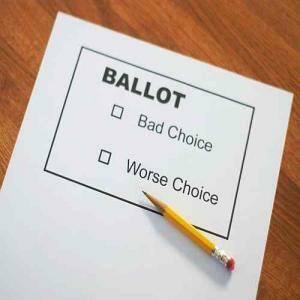 This year’s election is down to voting for the one candidate who’s least destructive (IMO). That’s so true for many and shows how broken the system has become. Oh, god, what a choice we’ve got: between a cynical pol and a raving lunatic clown. It feels like no matter which way we jump, we’re…yeah: doomed. America is strong and will weather any storm, but it definitely isn’t looking good.